The Audi A6 Allroad is a classy four-wheel-drive version of the A6 Avant estate offering lots of room for driver and passengers with added ground clearance for some not too strenuous off-roading. The Audi A6 Allroad offers all the benefits of a normal A6, so drivers and passengers alike will be perfectly comfortable. All the controls and switches are logically placed and there’s a good amount of seat and steering wheel adjustment, so unless you are Giant Haystacks there is no problem finding a decent driving position. As the Allroad matches up with a regular A6 Avant there’s plenty of space and indeed the former is beefed up so offers a vast 565-litre boot with the seats up. Lower the rear seats – an easy operation to accomplish – and up to 1660 litres of luggage can be accommodated. A wide opening and high roof make loading awkward objects simple. The interior is littered with cubbyholes and power points to make family life that bit easier. The Audi A6 Allroad offers plenty of head and legroom for rear passengers – three adults can easily travel in the back in comfort. Audi’s renowned build quality is in every fibre of the Allroad. The build quality is excellent with materials used inside and out suggesting it will last a very long time. The A6 Allroad is classy enough to operate purely in the executive sphere, but Audi have attempted to make it more a lifestyle model for families that get out and about. As such, it isn’t instantly recognisable as a soft-roader with steel body protectors, extended side sills and plastic wheelarches the main clues to its identity. The interior is cosseting making long journeys easy to bear. The leather seats are comfortable and supportive while fit and finish are outstanding. Servicing costs are likely to be similar to the A6 – more than reasonable – and while economy may be slightly dented by the four-wheel-drive system, retained values are likely to be top notch when it comes to selling it on or trading it in. The Allroad uses an air suspension that can be set to increase the ground clearance for gentle off-road excursions. It provides a comfortable ride and keeps the big estate body under control through the corners. The standard quattro four-wheel drive system ensures excellent traction. The handling is composed and stable, and the steering precise, if a little lifeless. Overall, the Allroad does a good job of ironing out the many humps and hollows that litter our roads. The Allroad does a great job of insulating its occupants from exterior noise at all speeds. Despite the presence of the roof rails which are standard on all cars, wind noise never intrudes into the cabin, and the engines are civilised performers. The Audi A6 Allroad is fitted with number of systems to deter car thieves including an alarm, Immobiliser , deadlocks, remote central locking, unique fit stereo, marked parts, locking wheel nuts, visible VIN and secure spare wheel. As far as safety is concerned the A6 Allroad covers all the bases with stability control and anti-lock brakes helping to avoid accidents, while the standard four-wheel-drive will help prevent an accident in the first place. There are also twin front, side and curtain airbags protect passengers if the worst happens. Options include adaptive headlights that can shine round corners. Every A6 Allroad comes with dual-zone climate control, aluminium cabin trim and modern touches such as an electric parking brake. The Allroad is also fitted with Audi’s MMI system that allows you to control various in-car functions using a rotary dial linked to a display screen. The Audi includes cruise control, electric heated mirrors, electric windows, heated seats, radio/CD player, alloy wheels, front fog lights and a hands- free phone kit. The Audi A6 Allroad is an excellent all-rounder offering a practical and stylish package for family motoring. The handling is sharp making it great to drive while the interior offers a quality fit and finish. 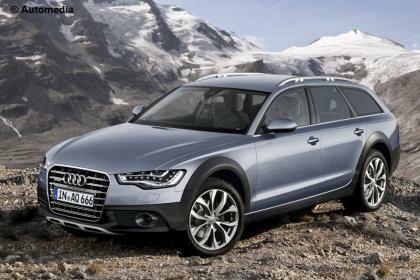 The Allroad is available with two turbodiesel engines. Both the 183bhp 2.7-litre TDI and 236bhp 3.0 TDI have plenty of pulling power for easy overtaking. The 3.2 V6 petrol is smooth and refined, if a little short of pull at motorway speeds. There are no such worries with the 4.2 V8, which is very quick but also quite thirsty. Most models sold will be diesels, with the 2.7-litre forming an admirable entry-level model. Smooth and quiet, it’s blessed with an excellent Tiptronic six-speed auto as well, though larger engines will be needed if performance is the order of the day.